The Commission on Human Rights (CHR) on Tuesday said the burial of the late President Ferdinand Marcos Sr. at the Libingan ng mga Bayani (LNMB) will not erase the human rights violations of the Martial Law era. CHR chairman Chito Gascon said the Supreme Court decision to allow a hero’s burial for Marcos does not undermine their call for justice. “This decision will not erase the uncontroverted fact of impunity for human rights violations committed during Martial Law that demands justice,” Gascon said. Gascon said the CRH stood before the SC to counter the Duterte administration’s pronouncement that the former dictator deserves a hero’s burial as a former president and former soldier. He added that the CHR presented human rights considerations in both the Constitution and international law in arguing for the petitions against the hero’s burial. “The CHR took a position before the Supreme Court that the Human Rights considerations in both Constitution & International Law runs counter to the Duterte Administration’s intention to bury the former dictator at LnB, particularly the guarantees for reparation & against non-repetition of Human Rights Violations,” Gascon said. Petitioners had argued that Marcos was no hero, citing his dubious record as a war soldier and massive human rights violations and corruption that tainted his 20-year rule. They also said that the Libingan burial violates the law giving compensation to Martial Law victims and the 1992 agreement between former President Fidel Ramos and the Marcos family to allow the return of the former president’s body to the Philippines, but only to have it buried in his home province of Ilocos Norte. 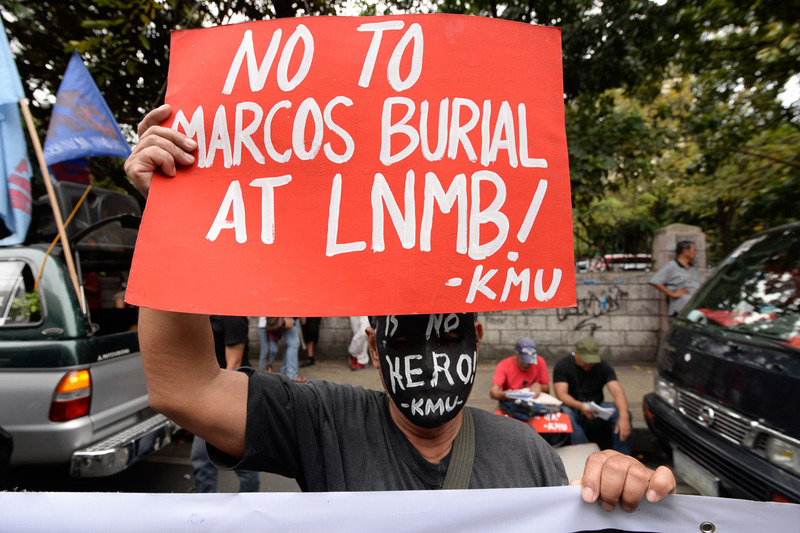 The government, however, said there is no law prohibiting Marcos from being buried at the LNMB, a cemetery reserved for soldiers, former presidents, national artists and statesmen, and that it is within Duterte’s power and prerogative to allow the burial. “The interment of the remains of former President Marcos does not and will not make him a hero,” the Office of Solicitor General (OSG) said in its comment submitted to the high court. A World War II veteran, Marcos was also neither dishonorably discharged nor convicted of a crime involving moral turpitude despite his ouster from office through a People Power revolt in 1986, according to the government. The government also said the petitioners’ claims for compensation as human rights victims are “distinct and separate from, and cannot in any way be connected to, the intended burial” because the process of vetting their claims under Republic Act 10368 is still ongoing. The government also said the burial will promote national healing and closure to one of the most contentious chapters of the nation’s history, a belief shared by the Marcos family and their supporters who held an overnight vigil in front of the high court.